I have a few too many video cameras at my disposal recently (I’ll post a video to show you). Given that, I was able to compare the new Kodak Zi8 to them and help you, the loyal consumer looking for a great gift this winter, find the best product that fits your needs Remember when Motorola Razr phones were all the rage? I do. Every 7th grader had one that fit nicely into their pocket while I had an unpopular yet better quality, bulky Nokia phone – my brick. Now that I’m older, I have a purse and don’t worry as much about the huge bulges in my pocket, so I will naturally opt out for better quality, yet chunkier things – much as our society now does with phones. One of those things is a camera. My mom bought a nice Canon camera that was affordable, large, and great quality. Now, back to video cameras. 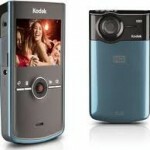 People tend to treat the new Flip Cam as they treated Razr phones. They’re cool, hip, desireable — BUT the quality is sub par. 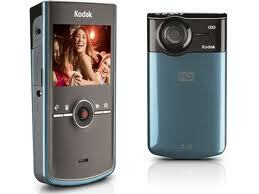 Sure, it has a USB jack like the Kodak Zi8, but it hardly has the quality. The Kodak Zi8 features both Macro and Distance shooting (which doesn’t work as well if you’re right in between both). It also has a feature that sends it miles apart from the competition: a mic jack. No, not necessarily so that you can hear sound (although I’m sure you can do that), but so that you can have better sound quality in your videos as opposed to a dissonant sound from afar. I also compared the Zi8 to my red flip HP v5040u (gosh, that’s a mouthfull) and the professional Canon we use to shoot our interviews. All of these offer HD recording at 1080p (p = pixels, presumably). Although the Canon fares way above the rest, it is also the most expensive and least pocket-worthy. I would not randomly throw it into my purse as I would with my HP v5040u or Zi8. Those are camcorders meant to be sold to the populace, for the common man, the average joe. And for that reason, you need to know that you are getting the best product for the most appropriate price. According to Tiger Direct, a website perfect for comparing electronics, the Zi8 is around $180 (but only $150 at Walmart). and the Flip UltraHD is $140. From the HP Direct site, the v5040u is $150. Thus, you get what you pay for. I find the Flip Ultra HD not user-firendly given its tricky touch screen and multiple options, and it also lacks in video and photo quality. The HP camcorder is similarly difficult, although cool with its flip-out capabilities and light for dark situations. By far, I prefer the Zi8 since it is easy to use, has great quality video and camera, and fits the best in my purse. I guess its not the fancy name that counts, but the use you find out of it. By far, I would go with the Zi8. If not, just use your bulky digital camera’s video capacity to get the job done – although it won’t have the massive storage capabilities (each camcorder comes with a memory card with a heft GB memory like 40GB) or quality of the aforementioned products. Try out the products at a store nearby, but whichever fits best is your hand, purse, or pocket is ultimately the right fit. And don’t forget to look for my videos that I’ll be posting soon.